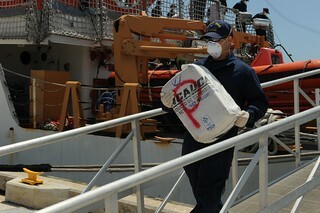 MIAMI — Crewmembers aboard the Coast Guard Cutter Legare offloaded approximately 3,300 kilograms of cocaine worth an estimated wholesale value of $110 million at Coast Guard Base Miami Beach Tuesday. This offload is a result of two separate drug interdictions. On March 15, a U.S. Coast Guard Law Enforcement Detachment aboard Her Majesty’s Canadian Ship Glace Bay, assigned to Joint Interagency Task Force South, patrolling the Caribbean Sea, identified a vessel suspected of smuggling drugs. The vessel was boarded by the LEDET, but no drugs were found. During the boarding, the fishing vessel caught fire and sank. All passengers aboard the vessel were safely disembarked. A subsequent search of the general area located approximately 97 bales containing approximately 2,400 kilograms cocaine floating in the water worth an estimated wholesale value of $80 million wholesale. On March 19, crewmembers aboard the Coast Guard Cutter Legare pursued a go-fast vessel in the southwest Caribbean Sea. An embarked, armed Coast Guard helicopter crew launched and fired warning shots in attempt to get the suspects to stop. The helicopter crew then fired disabling fire at one of the engines prompting the suspected smugglers to jettison 900 kilograms of cocaine, worth an estimated wholesale value of $30 million. A law enforcement team from the Legare boarded the vessel and verified it was Colombian-flagged, with five Colombian nationals aboard. The five suspects were transferred to Colombian forces for further processing. Since Oct. 1, 2013 the Coast Guard has seized 14,756 kilograms of cocaine with an estimated wholesale value $492 million. These interdictions were part of Operation Martillo, which is one component in the United States government’s whole-of-government approach to countering the use of the Central American littorals as transshipment routes for illicit drugs, weapons, and cash. Operation Martillo is an international operation focused on sharing information and bringing together air, land, and maritime assets from the U.S. Department of Defense, the Department of Homeland Security, and Western Hemisphere and European partner nation agencies to counter illicit trafficking. The Coast Guard Cutter Legare is a 270-foot Medium Endurance Cutter homeported in Portsmouth, Va.